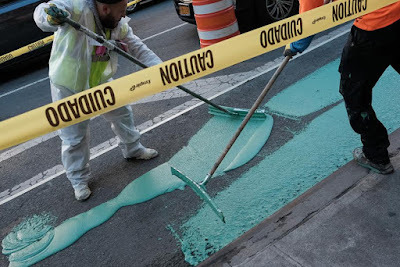 Workers were out this morning continuing to repaint the well-worn Second Avenue bike lane (this work started in late September, as the crew passed south of 14th Street). Did they actively seek out the worst smelling paint possible? 4th Ave. reeked for weeks afterwards. Who'll be the first to complain? Maybe they don't like the color? 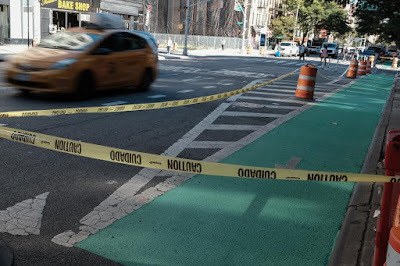 Maybe the CAUTION tape being upside presents a hazard of some sort? Is that a NIOSH approved respirator? They missed a spot! 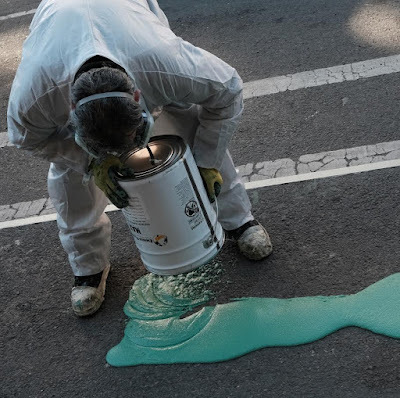 Not sure how many people have actually smelled the paint job, but when they repainted in the front of my building I swear my contacts were going to melt. The paint really smells. It Stunk! I held my breath while shooting. It actually does. I was on the UES when they were painting there and the crew were joking about how they were all going to die early from the fumes. Of course, they all were not wearing masks and eating lunch next to the wet paint they just applied. But spreading the paint around looks like fun! The green paint is totally unnecessary. The partitions from the parked cars and the occasional bike rider symbol is enough. The problem now with these lanes is the amount of people riding. The lanes are now not ample enough to handle cycling traffic. The other night riding home on 2 avenue in y'all's area, there was actual congestion with 10 bikers waiting for the light. It's more problematic when you got these Lance Armstrong wannabees and food app delivery motorcycle* riders cutting close when they pass and now there are idiots riding their honda scooters on there. *by motorcycle, I mean those electronic bikes that are so ubiquitous. They are bicycles with motors, ergo, motorcycles. Not complaining about the color or smell . . . but that's not how you paint a street! Perfect...now the pedestrians will know where to stand and gaze into their phones as they wait for the lights to change. Bingo. This dumbass etiquette is also prevalent on the 9th, 5th avenue and broadway bike lanes.